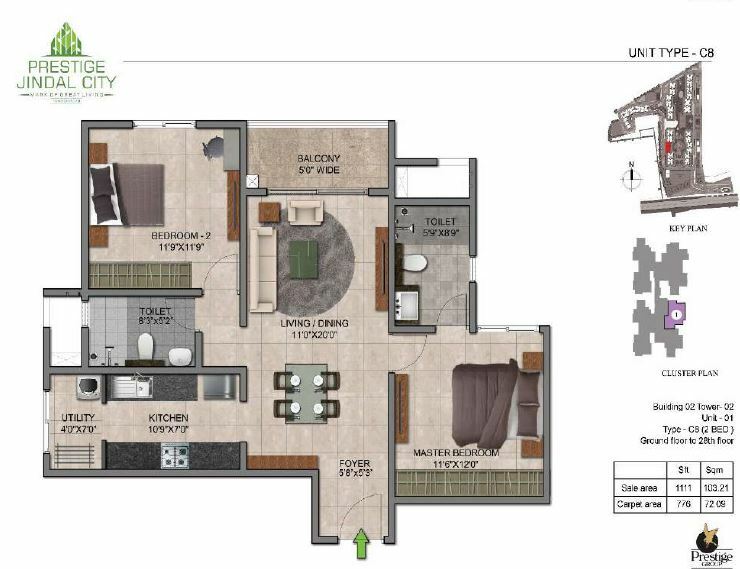 'Prestige Jindal City’ is another landmark project by Prestige Group. Backed by immense credentials this development is sure to make headlines in the real estate industry very soon. This grand creation by Prestige is sprawled across 32 acres of land surrounded by refreshing greenery all around. This will help you to give a fresh start to your day at Prestige Jindal City. This project has got 15 towers of G+29 floors. 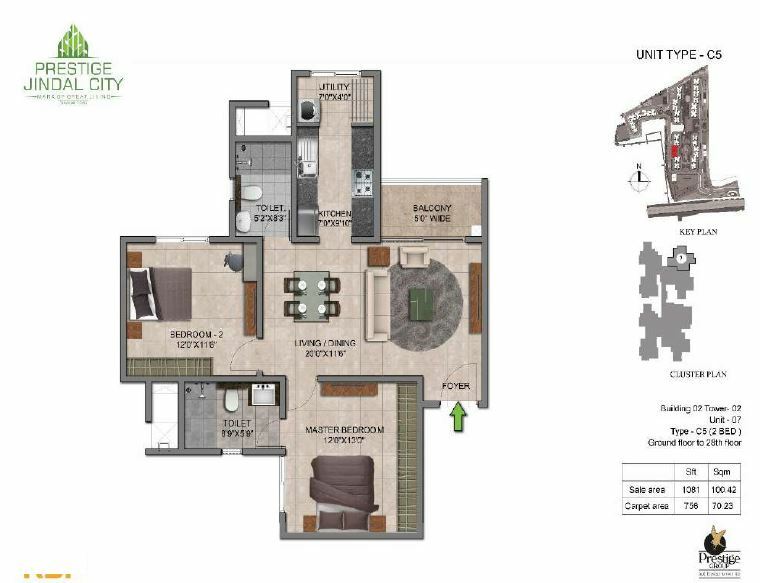 The houses in Prestige Jindal City are of different variant like 1 bhk, 2 bhk, 3 bhk and 4 bhk. There is total number of 3000 apartments (approximately) in this project. There is no hustle in payment plan and it is time line. 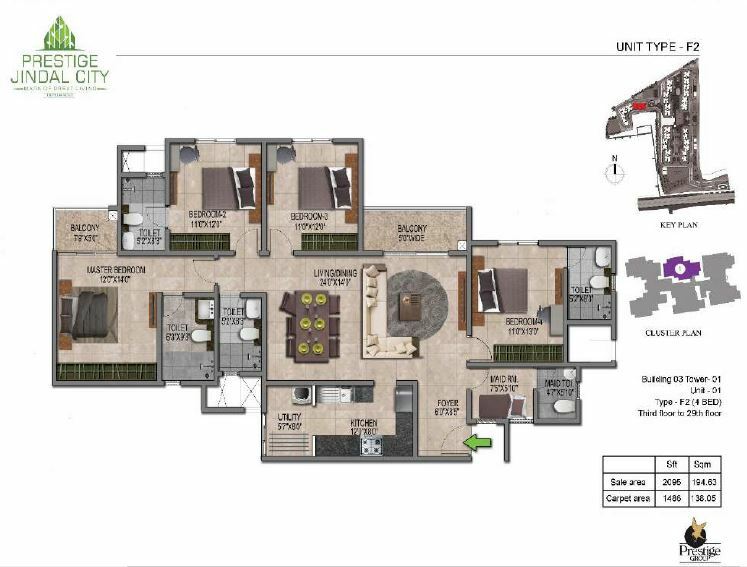 The base price of this project has been kept at 4850 per sqft. 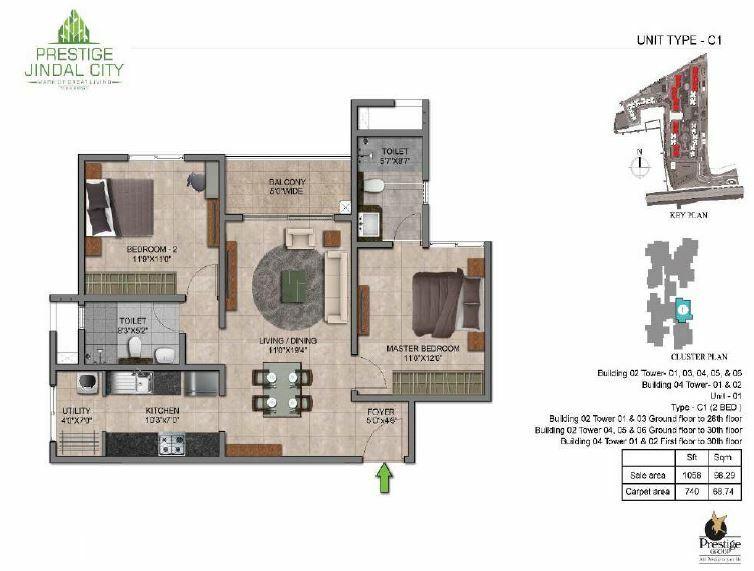 Prestige Jindal City is also providing state-of-the-art amenities to its residents. Some of these are Basket Ball Court, 24Hr Backup, Rain Water Harvesting, Club House, Play Area, Security, Tennis Court, Wifi, Intercom, Badminton Court, Community Hall, ATM, Health Facilities, Broadband Internet, Bank, Swimming Pool, Mini Theatre, 2 Multi-purpose Halls, Space Provision for Supermarket, Cafeteria etc., and many other exciting amenities. 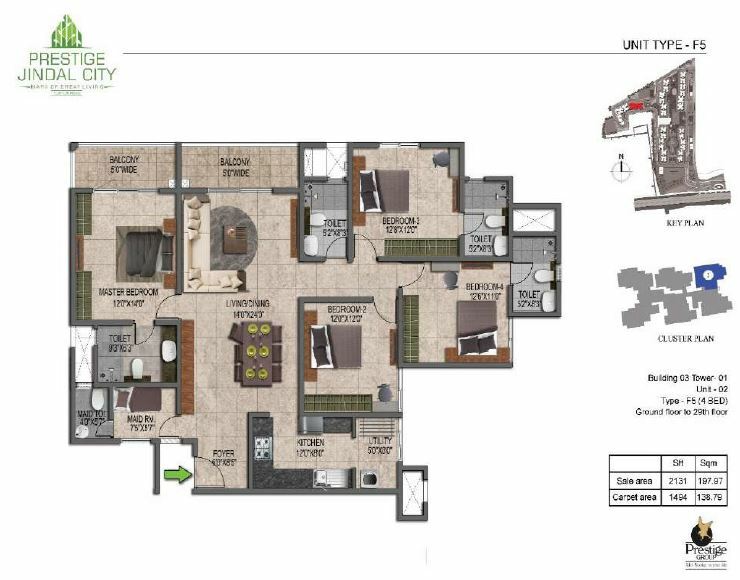 Prestige Jindal City, will be a premium landmark venture which is destined in finest location of city which has been gifted with all required quality to titled it as a perfect residential destination. This residential venture has been will witness both the extremes which a perfect residential should feature. Based on the inherent knowledge of how an perfect home should be designed has also been gifted with recent modern technologies included in both design and its real time adaption in each and every stage which results in such unique projects available in variety range which suits for the normal requirements which all look forward ,and also wide open to any particular customization suggested by the residents at any time if not in current . As always this residential venture will be all in one spot for all high quality amenities best in quality which should be essential part of every venture of this kind with out any virtual discrimination imposed pleasing a particular category residents .Along with this their are variety range community features will ensures every individuals feel like they are part of home-like atmosphere .Wide spread area left alone for the cultural activities will provide a perfect platform to enhance themselves through in the display of their inherent talent . 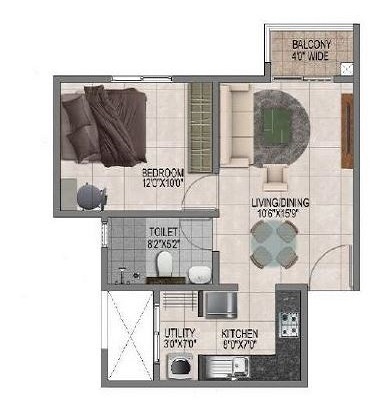 The specifications given in this project are best in class. Beautifully designed landscaped gardens, floral walkways, water bodies, boulevard, weather proof and dust free paint etc. Prestige is also taking up some green measures like Rooftop rainwater harvesting, Sewage treatment plant, Organic waste converter, Water recycling, Solar power for common areas lighting arrestor and Timer automated lights. The usage of such fine quality fixtures will help to maintain the elegance of being a Prestige creation in the real estate industry. Prestige Jindal City is located close to Yeshwanthpur, Rajajinagar, Malleshwaram, Hebbal and other major localities in city. So here comes the question of how to reach prestige Jindal City project from Hebbal of north Bangalore. Firstly drive towards Bellary road and continue to reach Mehkri Square road. From Mehkri circle take left to continue on CV Raman road. Later use a lane to opt for slip road to choose Bangalore- Shivamogga road or Bangalore-Mumbai highway and drive through this road for 5Kms. Now exit onto Nelamangala- Mejestic service road and the destination Prestige Jindal City will be seen to the left. The public transportation facility like cabs, taxis, auto rickshaws, BMTC buses along with private buses, makes reaching desired destination easier. The frequency of BMTC buses to this place is an added advantage. Tumkur road is one of the rapidly developing locations in west Bangalore and is evidencing a great deal of development with the change in the infrastructure of the location. The fast pace development of this region has put it in the category of places that can be brought under 100 smart cities plan of the government. Metro rail has improved the connectivity of the region and has established its connectivity with almost all the areas of the city. The nearest metro station from this project is Nagasandra Metro Station. Apart from this the accessibility of almost all the civic amenities from this area makes it suitable for the families to reside comfortably. The civic amenities includes schools, hospitals, malls, restaurants etc. the very famous orion mall is in Tumkur road. So, all these factors are leading to the fast pace development of this area. Prestige Jindal City is situated in Tumkur Road, Anchepallya. This is an elevated Tumkur Highway which connects Nelamangala, the Namma Metro Line and the upcoming Bangalore-Mumbai Industrial Corridor which connects the airport and the ORR. These steps have helped in playing a big role in upgrading the infrastructural development of Tumkur. The easy connectivity and availability of all necessary amenities in and around this stretch has also helped in boosting the demand for a residential abode in this locality. Areas like Jalahalli, Abbigere, Nelamangala, Magadi Road and few parts of Yeshwantpur have benefitted more due to its closeness to Bangalore city. The proposed Bangalore-Mumbai Industrial Corridor is expected to enhance the industrial growth in this stretch hence, transforming Tumkur Road into a flourishing residential, commercial and industrial area. Prestige Jindal City is located in one the prime zones of Bangalore, which suits both the extremes of what a perfect destination should posses .Being the host of the variety culture , which now been incurred within the its original such that it never lets any one to identify or demarking b/w them. Due to this wide range culture along with efficient administration have been the major contributor for such constant development that has been witnessed in past few decades marking it as one of the finest destination for both investment and cosmopolitan hub in economic map of the World . Not just branded as the Silicon Valley of India, it has many surprise entities which have still to be forecasted to the rest Being the IT capital of India which alone contribute the major percentage (35%) of total IT employees across India , concentrated which has been resulting a some large amount in the form of the export they make which has been the major contributor for the economic sector of India. Along with this sturdy position in IT field , Bangalore has also contributed in various sector right from education to the high profile aviation department. Due to constant up gradation done in the basic infrastructure has led to welcome investor form many sectors to utilized this wide market value .Information Technology , Electronics, Manufacturing Industry, Space technology, Biotechnology ,Aerosapce and Aviation department are some of the Key branches of Industries which have laid their foundation and developed as huge sectors such that it affects not only national market but also has their influence on the International merchandise. Such high profile destination has recently also evolved as the perfect destination for investments in the real estate sector. Prestige Jindal City is an exquisite residential township project that features skillfully and luxuriously designed homes of type 1, 2, 3 and 4 Bedroom units. It is located off Tumkur Road in West Bangalore and comprises very well structured elevated towers of G+29 floors hosting nearly 3000 premium homes. 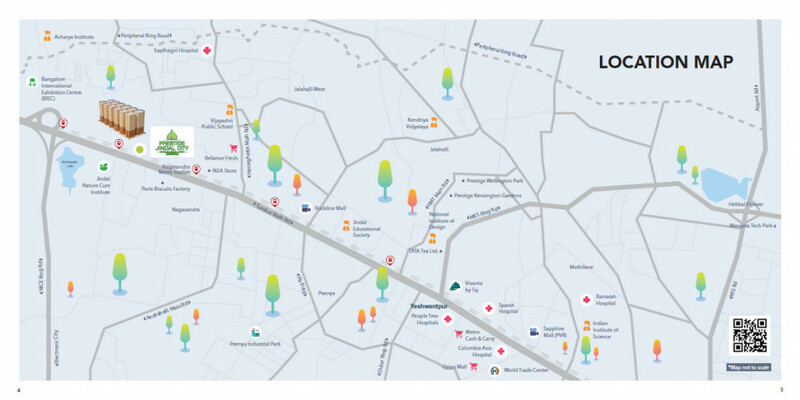 Where and what is Prestige Jindal City? Prestige Jindal City is located on Tumkur Main Road, close to NICE Road intersection. 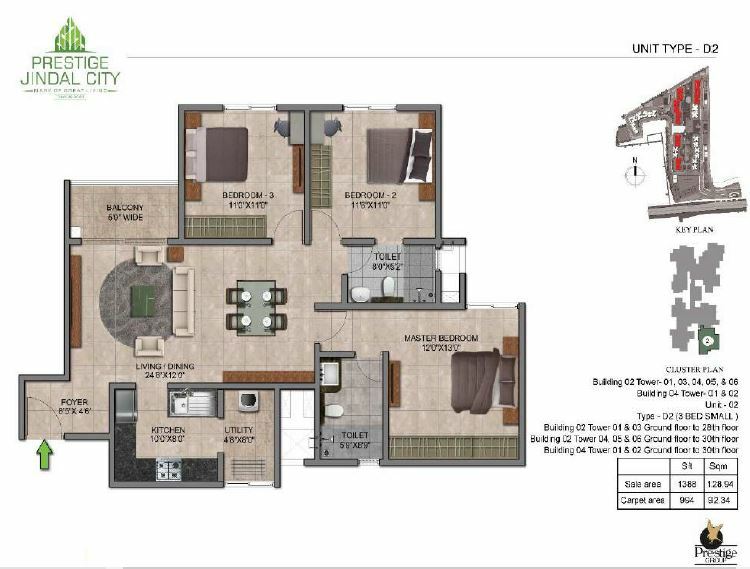 This is a premium residential development set on 32 acres of land. What is the project land extent? The project land taken in to account for sanction is 32 acres, (Less extents relinquished to BDA and acquired for metro station) and the necessary requirements for parks and open spaces have been provided for as per statutory norms. What are the distance advantages or the USPs of this project? The Jindal City/ Manjunatha Nagar Metro Station is located at the entrance of the project for easy access. This Green Line station will connect you to the city centre, South Bengaluru and multiple parts of Bengaluru connected to operational metro stations. Quick entry to NICE Road provides a connection to Mysore Road, Kanakapura Road, Bannerghatta Road and Electronic City. The Proposed Peripheral Ring Road (PPR) will connect Tumkur Road to Hosur via Bellary Road, Bengaluru Airport Road, Old Madras Road and Sarjapur Road. 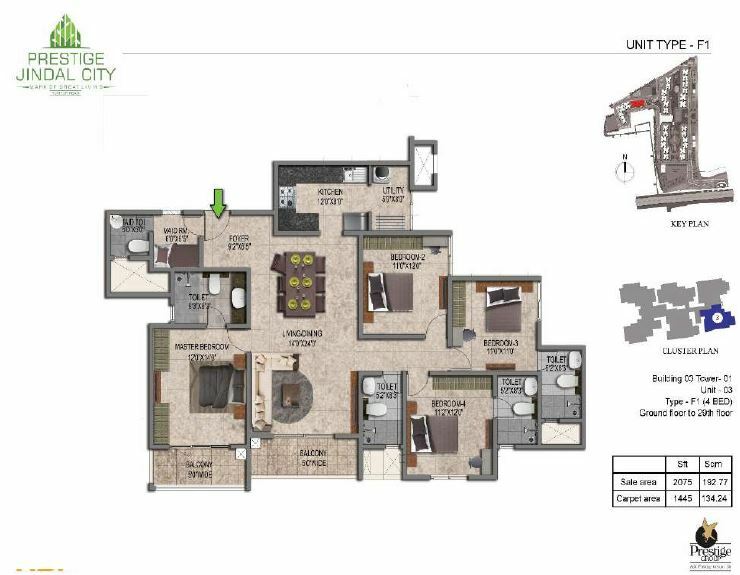 What are the Architects/Master Planner of Prestige Jindal City? The Architecture firm RSP Design Consultants are the key designers for Prestige Jindal City. Is there a clubhouse and what are the amenities provided in the project? The project will have an elaborate independent clubhouse with spaces for a Health Club, Gymnasium, Swimming Pool with Kids’ Pool, Banquet Hall, Mini-Theatre, Badminton Courts, Squash Courts, Tennis Courts, Basketball Courts, Multi-purpose Courts, Cricket Pitches, Beach Volleyball, Amphitheatre, Outdoor Gym, Skating Rink, Mini Soccer, Indoor Games, Pool Table, Table Tennis, other indoor games, Kids’ Play Area, Reading Room, Yoga/Aerobics, Party Terrace, Coffee Shop, Unisex Salon, Crèche, Clinic Space, Pharmacy Space, Laundromat and a provision for a Convenience Store. Is this phased development and what are the timelines for completion? The project is being developed in 2 phases and phase 1 will be ready for possession within 42 months from the date of commencement of construction. When does the development start and when can I expect to move in to my new home? Construction for phase 1 will commence by July 2018 tentatively and your new home will welcome you from 31st December 2021 onwards. What about car parking spaces? Has BDA/BBMP sanctioned the plans? Yes, the development plans have been sanctioned by BDA. Has RERA approved this project? Yes, the RERA Registration number is P1 – PR002823. Has Prestige Jindal City been approved by Banks/Housing Finance Institutions (HFIs) for loans? Yes, we have select Banks/ HFIs who will extend loans to customers based on their eligibility criteria. Who will take care of the maintenance of Prestige Jindal CIty? The maintenance will be taken care of by Prestige Property Management & Services. You can be rest assured Prestige Jindal City will be cared for by professionals. Tumkur road offers a smooth connectivity to its residents and the availability of all necessary amenities in and around this project makes it a demanding one. This project is in pre-launch phase and is expected to commence by mid of 2018 and will tentatively be completed by the end of 2021. 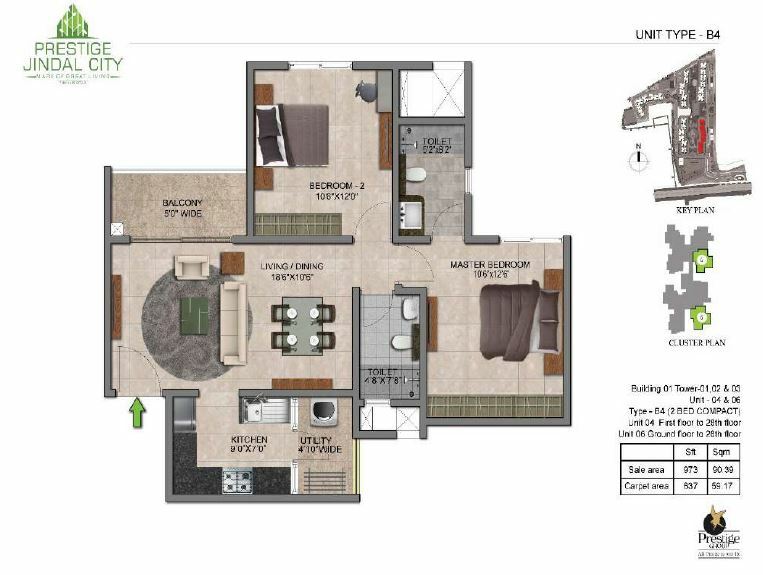 Various configurations available in this project are 1 bhk, 2 bhk, 3 bhk, and 4 bhk. 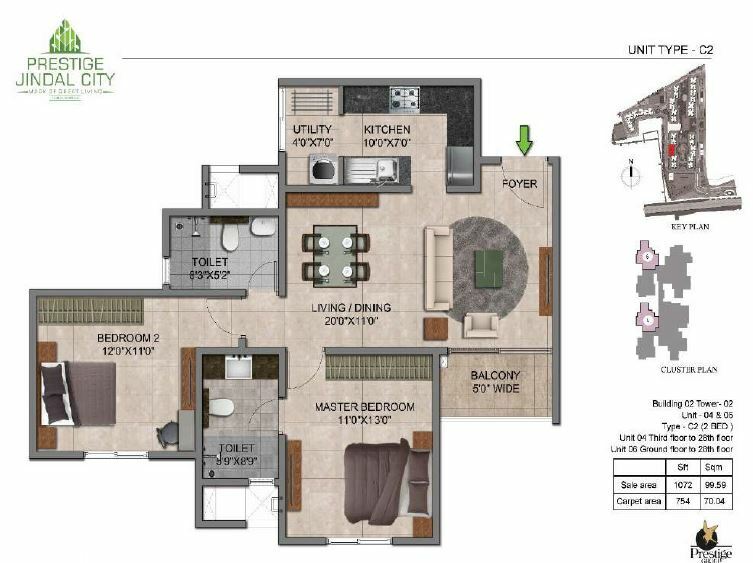 The base price of this project has been kept at 4850 per sqft. Prestige Jindal City is a gigantic residential community offering beautifully carved abodes and is located in one of the convenient locations off Tumkur Main Road in West Bangalore. This township is surrounded by well-established social and physical. Prestige Jindal City has cluster of amenities that include state-of- the-art clubhouse, vast swimming pool, children’s pool, gymnasium comprising of modern workout equipments, saloon & spa, children’s play area, garden area, tree-lined walking/jogging tracks, library, crèche, community hall, indoor-outdoor sports’ facilities, well planned parking area, rain water harvesting, in-house waste management system and round the clock security surveillance facility. Today one of the prominent belts emerging to the north-west quadrant of Bangalore is Tumkur Road. Tumkur Road is essentially an industrial location that links the main city with the traditional and well established industrial clutch of Peenya and Yeshwanthpur. Having an easy accessibility to major locations is one of the few factors which is changing the primarily and basic industrial character of this region and is boosting the demand for residential options around. There are several real estate residential projects coming up in Tumkur road like Godrej Gold County, Salarpuria sattva opus, Salarpuria sattva Laurel heights, Tata New Haven, Vaishnavi Gardenia and many more. Until recently the population of this micro-market was mostly in command by employees of the industrial houses here as the area is known as a hub for small scale industries like manufacturing ancillary parts for public sector undertakings, automobile industry, garment industry etc. Eventually this area has seen the arrival of large domestic and global corporations. This is the reason why this location of Tumkur road is experiencing great upsurge in real estate price and demand. An upgraded elevated Tumkur Highway connecting to Nelamangala, announcement of the Bangalore-Mumbai Industrial Corridor, connectivity to the airport and the ORR are additional factors all of which have favoured this industrial belt of Tumkur Road to achieve an advancing growth in real estate and will soar even more in the years to come. 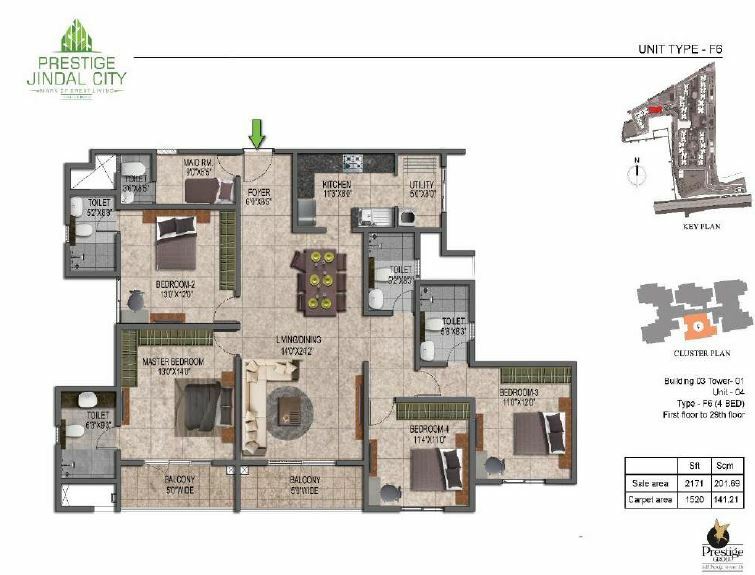 Prestige Jindal City is a landmark residential project by Prestige Group. Being located near to Peenya Industrial area Prestige Jindal City becomes the most sought residential hub. Its close proximity to Yeshwanthpur, Hebbal, Rajajinagar and Malleshwaram reduces the travel distance to some extent. 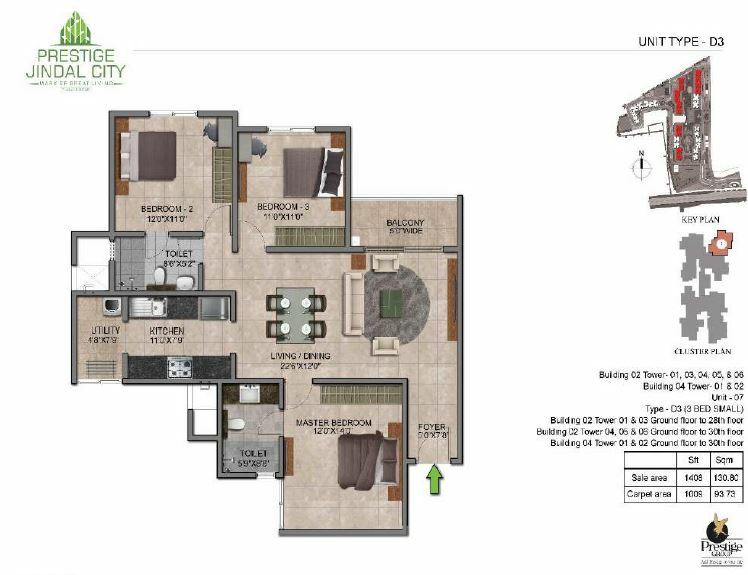 Prestige Jindal City is located in Bagalakunte, tumkur road belonging to west Bangalore. The question arises of how to reach Prestige Jindal City from Whitefield. Starting from Whitefield, head north on Whitefield main road towards outer circle. Turn slightly towards ITPB main road or whitefield main road. Continue to Hoodi Main road later enter into kundalahalli main road, turn towards ITPB main road to pass by Bhoruka Tech Park. Turn right onto NH44 or NH75, continue to follow NH75. Exit onto Nelamangala-Majestic service road. Later make a u turn after a while to reach the destination. The means of transport within Bangalore makes it easy to reach the destination in 1 hour 35 mins. Public transport along with private transport like city taxis, cabs, auto rickshaws makes the travel be trouble-free. 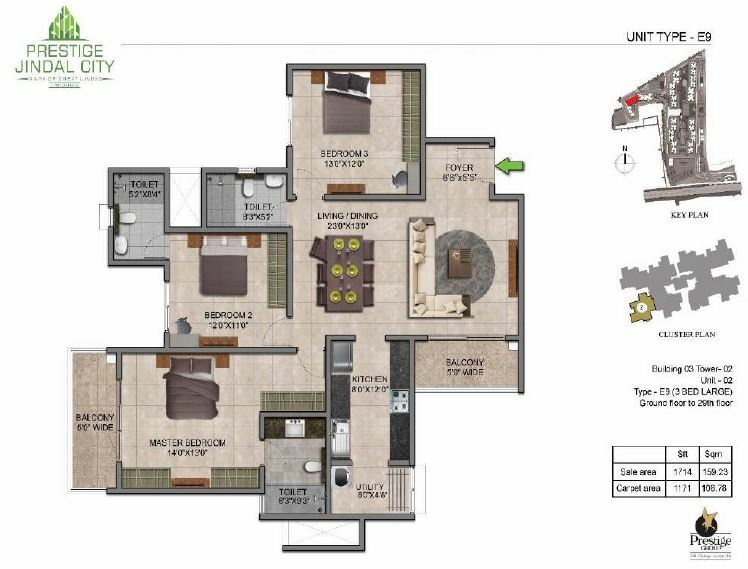 1 BHK | SBA :607 sqft. 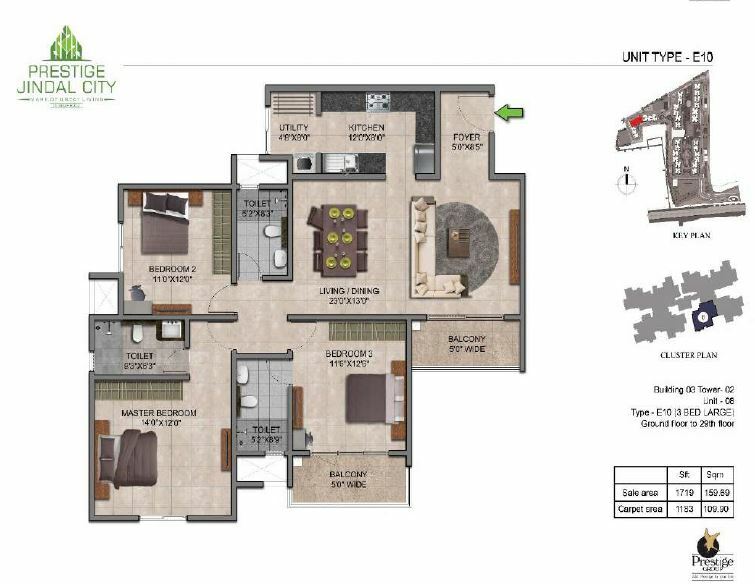 2 BHK | 969 sqft. 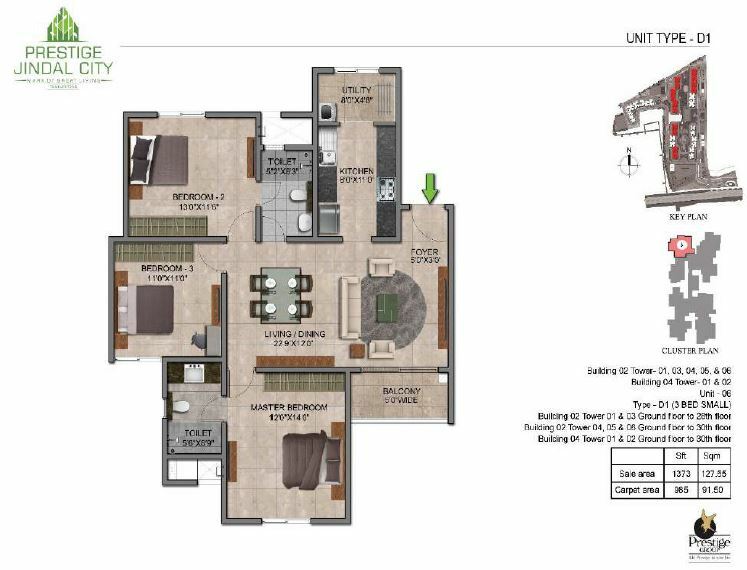 2 BHK | 973 sqft. 2 BHK | 1058 sqft. 2 BHK | 1072 sqft. 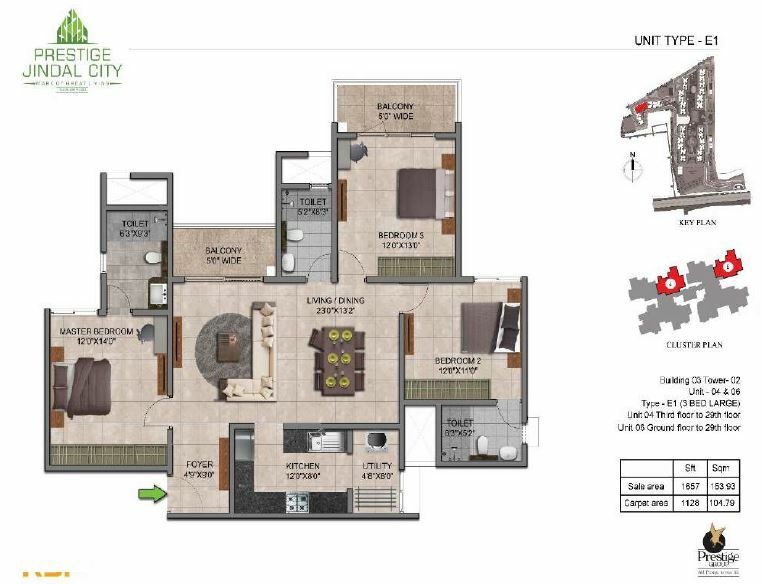 2 BHK | 1081 sqft. 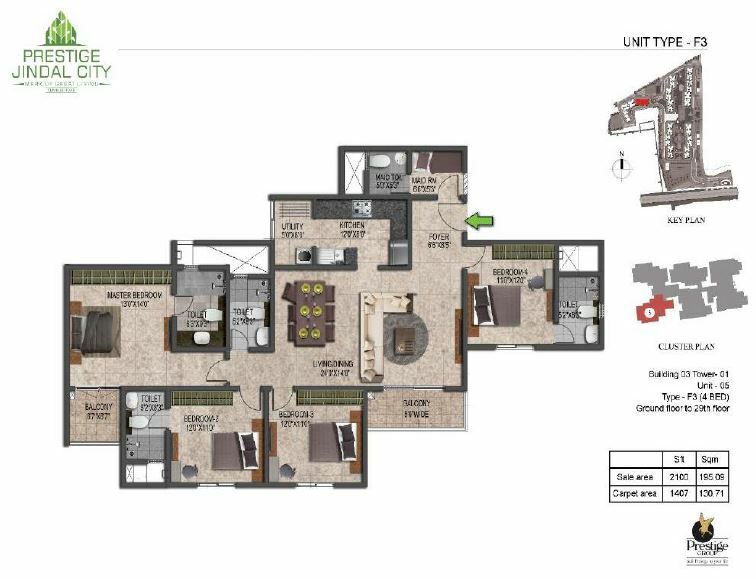 2 BHK | 1111 sqft. 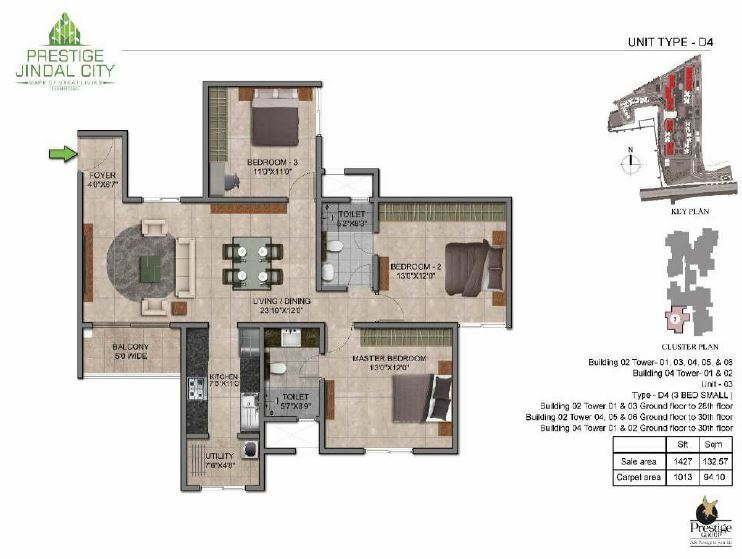 4 BHK | SBA :2095 sqft. 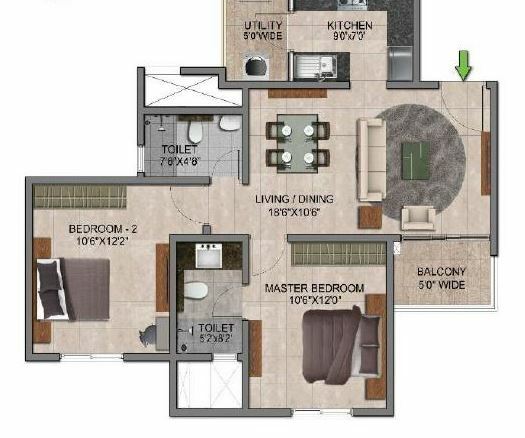 4 BHK | SBA :2100 sqft. 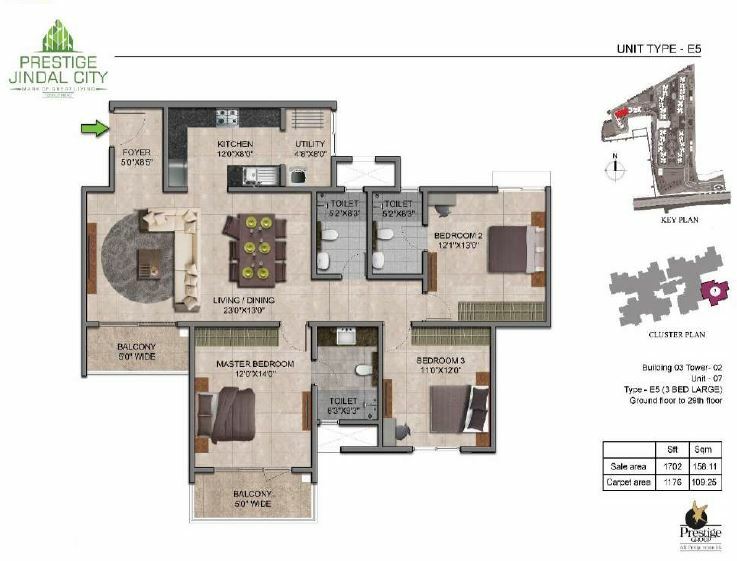 4 BHK | SBA :2131 sqft. 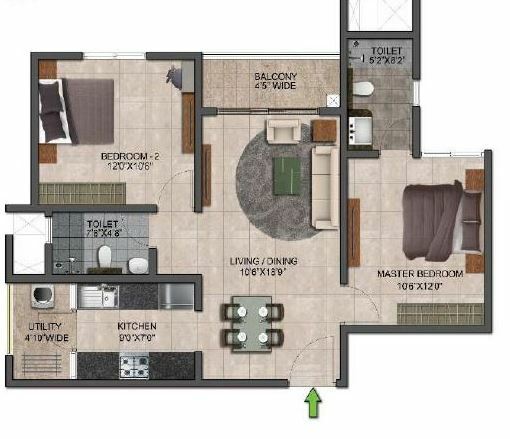 4 BHK | SBA :2171 sqft.